Qing era copy of Weisheng Jieyao (Eight Pieces of Brocade). Texts such as these helped to inspire, and were often incorporated into, the modern Qigong phenomenon. 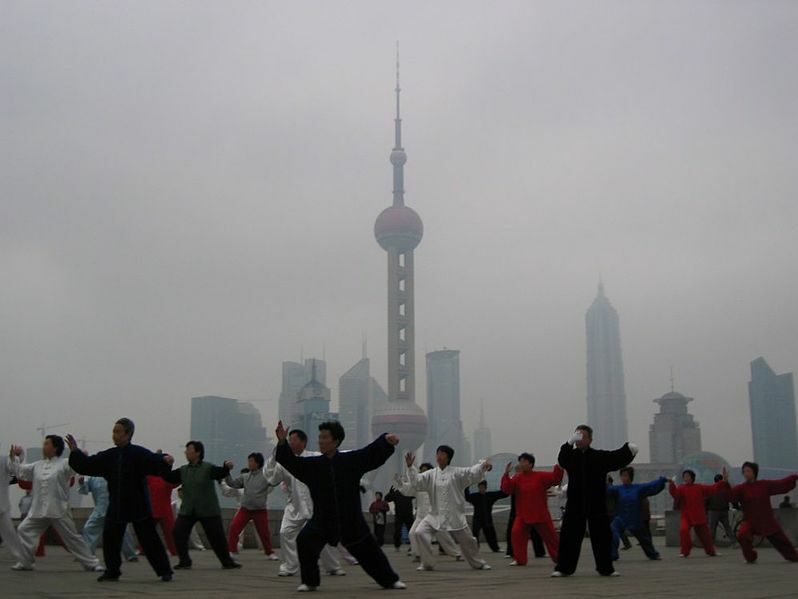 Why Does Chinese Martial Studies Need to Focus on Globalization? In a previous post I asked whether “globalization,” understood as the increased movement of capital, goods, people and ideas through networks divorced from the traditional state, is having an impact on the traditional Chinese martial arts. Globalization is a large enough subject that it is difficult to generalize about. Most of my academic career has been devoted to understanding these forces, both in the 19th century and today. In fact, those were the questions that first introduced me to Chinese martial studies. The history of the Chinese martial arts provides us with lots of great data to test some of our most important theories about how globalization functions. Better yet, a lot of this data is very fresh and has never been seriously examined before. Still, one must avoid sweeping generalizations. The previous article narrowed the field of inquiry and asked how the spread of smart-phones and other cheap communications technologies affected youth subcultures and social networking strategies in China. We discovered that while the martial arts remained a popular theme in the mass media, actually taking Kung Fu classes had lost much of its utility as a networking and selection tool. Young adults that were looking to form “sworn brotherhoods” (informal organizations to advance their careers or social lives) were now less likely to join amateur martial arts classes or clubs than they might have been in the 1980s or 1990s. So while cheaper modes of communication and networking were helping to spread the Chinese martial arts in the west, they were having exactly the opposite impact in China proper. Fewer middle class young people are taking up the recreational study of the traditional martial arts than did so in the recent past. In the current post I would like to look at a different aspect of globalization’s impact on Chinese society, and a different demographic that is often involved with the martial arts. Throughout the early 1990s the Chinese government moved to rapidly privatize large sections of the Chinese economy. State run manufacturing firms were sold off and encouraged to make a new range of low cost goods that could easily be sold to the voracious economies of North America and Europe. “Economic development zones” were established in cities throughout eastern and southern China. At the same time the state began a rapid retreat from a number of other areas of personal and social life. These reforms, pushed through by the CCP leadership, led to rapid economic growth as China’s exports skyrocketed. Sunday morning Taiji practice at the Temple of Heaven in Beijing. The Liberalization of the Economy and its Affect on Medicine and the Martial Arts. This is an economic narrative that most of us are very familiar with. What we do not normally consider is the immense economic and social disruption that this caused for the Chinese people. Some of the changes were certainly welcome and positive. Shorn of its subsidies the media suddenly discovered that it had to actually write stories and produce programs that people would be willing pay for if it wished to survive in the new era of privatization. This led to a publishing boom in China throughout the 1990s. In fact, this boom coincides perfectly with the emergence of the high quality Chinese language literature on the martial arts and their history that has opened the field of Chinese martial studies up and is still driving it forward today. This relaxing of state control in the media was particularly advantageous to Qigong and martial arts masters because their subjects were consistently strong sellers and they were viewed as being “apolitical” and safe to publish (at least until the Falun Gong incident). Media that was produced in China could also occasionally be exported and both martial arts master and Qigong teachers found a vast global audience for their skills in the 1990s. Nevertheless, there were also challenging aspects to this massive privatization of the state. Chinese workers, who had previously been guaranteed employment and housing now found themselves exposed to fluctuations in the global economy, and speaking as a professional political economist, that is never a good thing. While the wealthy have all sorts of ways of hedging against the risks and tides of the global economy (and hence can become even richer through trade and finance) working class individuals have no such insurance against declining wages, increased employer demands and ultimately unemployment. In China wages were already quite low at the start of this period in 1990, nor was their rise all that rapid throughout the ensuing two decades. This led to an ever widening gap between the rich and poor, something that had not been as apparent in the 1960s or 1970s. Yet despite what you might hear in the western media, low wages alone do not tell the entire story of China’s economic rise, or the woes of its workers. Employees of newly privatized firms found that the global economy required tremendous sacrifice and flexibility on their part. Large orders with tight deadlines meant that 12 or even 14 hour long work days became common at many manufacturing plants. Chinese labor has always been incredibly hard working, but the new conditions introduced in the 1990s were quite literally pushing the boundaries of what was physically and psychologically possible. In fact, for many people this new “flexibility” proved to be too much. Chronic physical and psychological conditions emerged in greater numbers. The middle aged and elderly (not surprisingly) were particularly hard hit. The situation was compounded by sweeping changes in the Chinese medical system. Medicine and public health had been difficult issues for the Chinese government. The Communist government wrestled with these challenges for much of the post WWII period. Still, by the end of the 1980s it appeared that real progress had been made. While rural areas were still undeserved, at least 85% of the Chinese population was covered by state run health plans and had some access to free medical care. However, these broad based programs were deemed to be too expensive for the newly liberalized state and in the 1990s the health care industry came under pressure to switch to a “fee for service” model. All sorts of basic health care procedures and medications that had been free were now available only to those who paid. Given the low wages that most individuals were making very few could pay. Both the quantity and quality of health care consumed by most Chinese individuals plummeted during the 1990s. According to a study by the prestigious New England Journal of Medicine the percentage of Chinese workers with access to health care plummeted from 85% in the late 1980s to only 25% in the early 1990s. Nancy N. Chen, a physical anthropologist who specializes in Chinese healthcare (University of California, Santa Cruz) reported a disturbing rise in infant mortality over the same period as more women opted to deliver children at home, unable to afford prenatal care or hospital services (Breathing Spaces: Qigong, Psychiatry and Healing in China, Columbia University Press (2003), page 45-47). Individuals with life threatening illnesses (such as cancer) or chronic conditions (like arthritis) were often denied medical care all together. Much of this tragedy is obscured by official statistics. For those of us who study globalization and the Chinese economy it comes as no great surprise to learn that data is routinely selectively reported in ways that are advantageous to the Chinese state. If one simply downloads the World Bank World Development Indicators (WDI) dataset for China and looks at the public health variables all you will see is smoothly increasing life expectancy and declining infant mortality rates for the 1960s to the present. However, as the demand for workers increased a large number of individuals became internal “illegal immigrants,” moving to cities like Guangzhou to take poorly paid factory or service jobs without official travel documents. These individuals tended to be too poor and scared to seek health care. Since they were not “official residents” their illnesses, crimes and even deaths tended to go unreported. Factors such as these cause considerable “measurement error” in the official numbers. Nevertheless, other readily available statistics are impossible to gloss over. For instance, the same World Bank dataset reports that during years 1989-1990 94% of all births were attended by some sort of medical professional. A few years later that figure would drop by 10%, to only 84%, as even pregnant women could no longer afford vital health care. This trend, more than anything else, seems to be responsible for the rise in infant mortality noted by Chen. It is also the tip of the iceberg that suggests much deeper problems with the Chinese medical system. Yang Style Taiji in Shanghai, 2005. The Rise of the Medical Martial Arts and Qigong in the 1990s. All forms of Traditional Chinese Medicine (TCM), including acupuncture, herbalism, breathing exercises and martial arts (especially Taiji) are relatively popular in China today. When looking at TCM most western observers see only a vast vista of historical continuity. Chinese language publications and individual instructors often encourage this perception, glossing over the fact that modern Qigong is not exactly the same thing as ancient Taoist internal alchemy (though they are certainly related). The term “Qigong” itself was apparently coined by the Communist traditional medicine establishment and doesn’t date any further back than the 1950s. The Communist party officially supported Qigong research and the teaching of the “internal” martial arts (particularly simplified forms of Taiji) in the 1950s. These ancient arts were distinctly Chinese and they seemed to offer great health benefits at a relatively low price. During the 1960s and 1970s the national mood changed. The Cultural Revolution turned on practitioners of these arts precisely because of their association with China’s ancient “feudal” and “superstitious” past. There were other reasons that individuals turned away from TCM as well. Western medicine, based on biology and chemistry, became more available as the state modernized. It also proved to be very efficacious. Chen reports that by the late 1980s there were relatively few clinics or patients who favored TCM in China’s main urban areas. It looked as though biology-based medicine had won the day. However, these modern western hospital and biology-based treatments were also very expensive. More expensive than the state was interested in paying, and out of reach for many of China’s working class. Once the state subsidized insurance programs were cut, the medical field was ripe for a shakeup. It was this drastic curtailing of access to biology-based health care that spurred the rapid development of TCM in the 1990s. The state’s emphasis on entrepreneurship allowed thousands of acupuncture and herbalism clinics to emerge seemingly overnight. Even more popular were “internally” focused medical treatments that focused on Qi and regulating breathing to ensure health. Chen has documented in great detail how this period of social dislocation led to the rapid explosion of the Qigong market. It would appear that exactly the same mechanisms which she discusses were also at work in martial arts circles. Like Qigong, independent publishers found that martial arts books and videos sold well. Bookstores promoted these works as they were seen as “apolitical” and safe. Moreover, some factory workers wanted to avoid expensive medicines for chronic conditions, while others sought for the amazing endurance of the “ancient masters” to make it through their 10-12 hour shifts. Increasingly many turned to the martial arts as a way of gaining the “flexibility” that global markets demanded. Individual teachers found that they were able to build vast organizations which would have been unthinkable even a few years before. 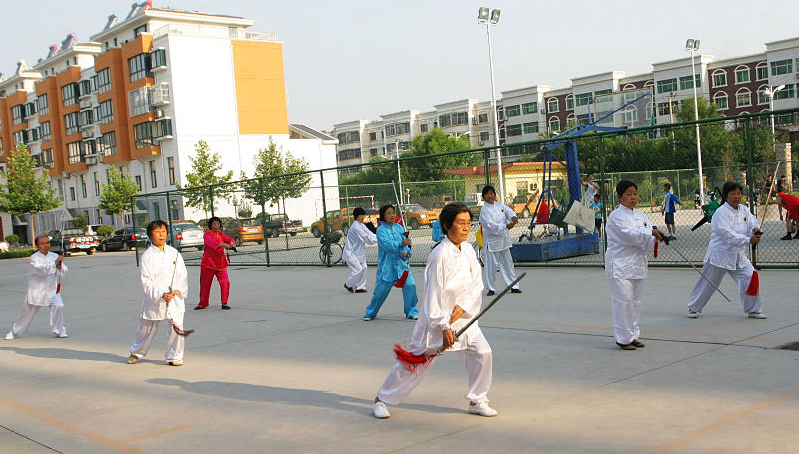 While the martial arts had elicited feelings of suspicion in years past, Chinese culture is quite dedicated to the pursuit of self-cultivation and health. By rebranding the arts in such a way that fighting was diminished, or eliminated altogether, and the ensuing void was filled with “healing exercises” and discussions of “self-improvement” a new sort of martial product was created. This was a martial movement that millions of stressed, sick or worried individuals would be willing to pay for. Martial arts masters that sought to cater to these needs had to develop marketing and institutional structures that were different from those who sought to appeal to young males and their dreams of martial glory. And it is truly amazing how successful their rebranding exercise has been. Everyone, including party officials and celebrities, seems to have taken up Taiji or one of the other “internal” martial practices. 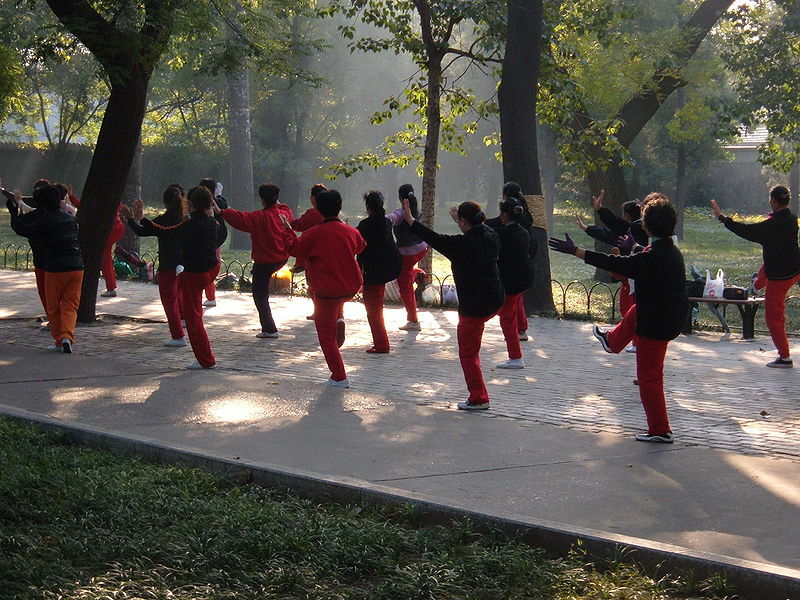 While the rise of the martial arts was never as steep and dramatic as the explosion of interest in Qigong that Chen notes, it has proved to be insulated and resilient to the disruption caused by Falun Gong and the state’s subsequent move to regulate and oversee the market for Qi instruction. The martial arts have probably benefited from the perception that they are more orthodox, traditional and less likely to develop into a religious cult than pure Qigong exercises. The success of this movement within the “internal arts” has clearly been the greatest among individuals over 40. It is probably no coincidence that these individuals are the most likely to have some sort of chronic medical problem and to be the least well served by the official medical establishment. For many of these practitioners, martial arts and Qi cultivation has not only become a part of their daily routine, it is the cornerstone of their healthcare strategy. The “internal” martial arts and other Qigong practices tend to be especially popular among senior citizens and others who are seeking relief from chronic conditions. Economic flows within the global economy seem to generate their own gravity. This social gravity can have an important impact on the migration of ideas, trends and cultural borrowing across borders. Both Qi cultivation and the medicinal turn in the Chinese martial arts have proved to be popular practices in both North America and Europe. It is worth our time to pause and consider how these practices, originally developed in China (in the early 1990s) in response to the dislocations of globalization, were so easily exported to the much richer, consumption driven, economies of the west. No doubt orientalist attitudes that are predisposed to see the east (and the Chinese in particular) as a font of “inscrutable wisdom” helped. Further, the existence of a widely networked New Age industry helped to rapidly monetize and distribute new techniques or ideas. Yet it was probably the language of healing and self-cultivation that the Chinese developed for their own market that was the deciding factor. Of course this language was not understood in identical ways on both sides of the pacific. Whereas Chinese workers were concerned with the ability of Qigong to heal cancer or to sustain one through brutal assembly-line shifts, American and European students were often more interested in addressing the spiritual and psychological ills of globalization. The move away from manufacture to service and information based economies have also had an adverse impact on western workers. In economic terms real wages in America have been falling for most workers for at least two decades. Unemployment became a chronic concern in many sectors throughout the 2000’s as terms like “outsourcing” moved from the domain of business-speak to everyday concern. Further, rising awareness of the importance of psychological well-being and basic fitness has not been accompanied by an increase in the resources dedicated to those problems. Declining insurance rates and rapidly rising health care costs have also pushed a number of Americans off the orthodox medical path. For a small number of people TCM has become an affordable alternative to conventional health care. For others the healing promise of Taiji, and the other internal arts, has been spiritualized and is seen as a remedy for the strains of life in an advanced capitalist society. 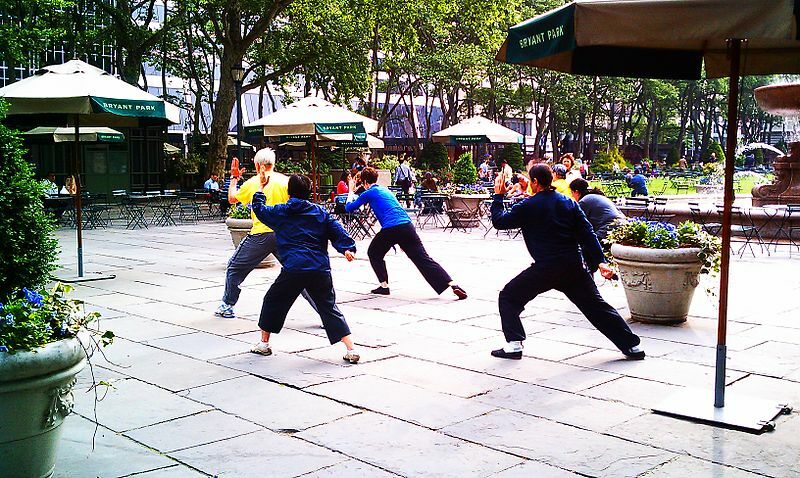 Morning Taiji in Bryant Park in New York City. The “healing discourse” of many traditional Chinese martial arts has made them a success in the global marketplace for alternative physical therapies and spiritual practices. Conclusion: The “Traditional” Chinese Martial Arts as a Global Industry. The swelling flow of books, videos, teachers and students has proved to be a valuable industry on both sides of the Pacific. It is interesting to me that there is enough similarity in the problems faced by Chinese and American citizens that a common discourse on the medicalization of the martial arts can exist. At the same time it is important to be aware of how the meaning and use of certain symbols and institutions evolves as they migrate across national borders. The wellness industry surrounding the traditional Chinese martial arts in America and the PRC are related, but they are not identical. As Chan illustrates throughout her book, in the west TCM is seen as a holistic “alternative therapy” whereas in China it tends to be more orthodox in its social situation and is often turned to because it is the only medical strategy a patient can afford. Over the last few decades fluctuating economic trends have had a huge impact on the traditional Chinese martial arts in both the east and the west. It is impossible to understand many of the most basic trends that we see without understanding the economic reality that underlay and support them. Globalization remains a critical and poorly understood aspect of Chinese martial studies.